As Syria's brutal civil war drags on, Israeli military officials are preparing to deal with a rapidly changing security reality brought on by an influx of Islamic jihadists from throughout the world. In this new emerging landscape, both Shi'ite and Sunni terrorist entities grow more powerful and enjoy access to advanced weapons. Monday night, Lebanese media reported that the Israeli Air Force bombed Hizballah targets on the Syria-Lebanese border, allegedly targeting the transfer of advanced arms, and killing Hizballah operatives. Israel did not confirm the reports. In the past, it has publicly warned that attempts to move strategic weapons from Syria to the Iranian-sponsored Shi'ite Hizballah would not be tolerated. "Our policy is clear," Prime Minister Benjamin Netanyahu said in response to a question on the raid, "we will not speak about reports of what we did or didn't do - but we do all that is necessary in order to defend our citizens." The Israeli defense establishment is determined to prevent strategic weapons from falling into the hands of any terrorists, and is deeply concerned by the fact that Hizballah is the most heavily armed terror group on Earth. That arsenal consists of some 100,000 rockets and missiles, and Hizballah also is trying to obtain satellite-guided projectiles in order to target Israeli air bases and national infrastructure installations in a future war. But the Middle Eastern regional upheaval, and the Syrian civil war, has also created a new radical presence on Israel's border, in the form of 30,000 Sunni jihadis, made up of foreign and local recruits. Most belong to Al-Qaida's official branch in Syria, Jabhat Al-Nusra, and its rival group, the Islamic State of Iraq and Syria (ISIS). In Syria, the two groups have collectively carried out 15 percent of all suicide bombings in the world in 2013, and are raiding Syrian army arms warehouses as they combat the Assad regime. Both groups seek the establishment of a radical Islamic caliphate, and as such, are ideologically committed to Israel's annihilation. 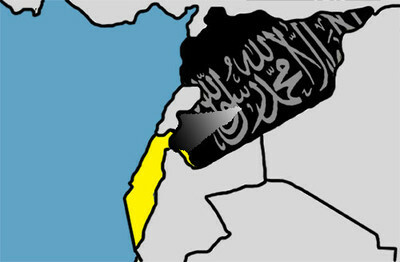 Additionally, Jabhat Al-Nusra is under the command of Al Qaida central chief Ayman Al-Zawahiri, who is attempting to orchestrate jihad attacks against Israel. Events in Syria show that predictions of al-Qaida being on the ropes were premature. Al-Qaida and other jihadi elements are witnessing a resurgence on a massive scale, filling in the vacuum left by the shrunken Syrian state. Across the border in Israel, the IDF believes that the chances of an all-out war in the region have fallen, but that the chances of a border incident sparking a wider conflict have risen due to all of the instability in the region. For this reason, the IDF announced this week the deployment of a new territorial division to the Golan Heights on the Syrian border. The 210th Division will replace the previous division on the border, and will specialize in combatting terrorism and guerrilla attacks from Syria. Its aim will be to contain incidents and respond quickly, thereby preventing a wider escalation. Its modus operandi will be based on substantial intelligence capabilities, combined with precision firepower. Senior IDF commanders say they hope this combination can help prevent a border incident from spinning out of control and turning into a wider conflict. These lines of defense will be backed by air defense systems, like the Iron Dome batteries against short-range rockets and David's Sling, designed to cope with larger missiles. According to Israel's Military Intelligence, Syria is undergoing a historic, strategic change, and will never go back to what it was. The Syrian army is not seeking conflict with IDF, and for now, rebel forces aren't either. But radical jihadi units are gaining ground on Syrian-Israeli border, and likely will turn their weapons on Israel at some point. The 210th division will enjoy a range of resources, like tank battalions, artillery, and infantry brigades at its disposal. One of its major focuses will be on getting intelligence on events in Syria. Much of this information will come from the IDF's Military Intelligence Directorate, based at military headquarters in Tel Aviv. all of the global jihadi operatives north of the border. As a result, more than 1,000 soldiers serving in Military Intelligence have been reassigned as part of an intelligence reshuffle. The end goal, senior military sources explain, is to ensure that army units on the ground know where to direct their fire in future clashes. The more the region becomes chaotic, the more the ability to accurately identify one's attacker becomes acute. "predictions of al-Qaida being on the ropes were premature." They were downright wrong and of a "suspicious" political nature. Couple that with western, especially American, willful blindness regarding the threat of Jihad and attempts to respond to anti-western demands from prominent Muslim Brotherhood front groups, like CAIR and ISNA, with abject appeasement add more urgency to the plight of Israel. That tiny Israel is the last bastion of resistance and defense against the obvious Islamic threat should frighten and concern every freedom loving person on the planet.